Lightweight (3 lbs) and portable. Compact and powerful - 1/4 HP, 200 Watts of power for blending. Makes smoothies, soups, pesto, puddings and more in less than 30 seconds. Strong motor easily crushes ice cubes to make hundreds of delicious and nutritious recipes. 1. One-Touch Pulse Mode to let you conveniently make salsa or crush onion into chunks. 2. 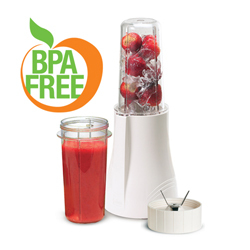 Push & Twist Continuous Mode to blend fresh foods continuously for about 30 seconds. from probing hands and fingers. The advanced safety features built into the Personal Blender prevent operation when blades arent completely enclosed within the cup, making it impossible to come in contact with the spinning blades. Clear container closes tight with a lid for easy storage. 2 BPA-Free Blending Cups - 16 oz. Instruction Manual with 40 e asy-to-follow recipes for soups, sauces, salsa, dips, porridges, pestos, pates, puddings and baby foods. Height: Motor Base: 6.5 in. Base diameter at bottom: 4.75 in. *Free Shipping offer on some appliances applies only to continental U.S.